Crossfit can seem like a daunting undertaking for many coaches. It’s not so different to other sports. It should be viewed similarly to team sports where there are multiple components required to perform. One thing I think needs to be addressed is the intensity of a WOD (Workout of the Day). Many believe that if you aren’t redlining or pushing the limits then it’s not tough enough or productive. While skill and strength work may be done at lower intensity I feel Metcons are a source of concern. They tend to neglect lower intensity steady state work. Several big names in crossfit performed poorly in the endurance style events. 2011, 2012 and 2014 had events which brought some of top competitors to their knees. Many wondered why the “Fittest Athletes on Earth” struggled on “Weekend Warrior” style activities. Some blamed the lack of skillset, others the heat and the competition intensity. Physiologically I think there is quite an obvious answer. These athletes are over reliant on glycolytic metabolism. When you train at high intensity repeatedly you adapt to that environment. Glycolysis is the dominant energy system and it will increase in terms of capacity when training. Oxidative metabolism can be improved when training at high intensity but only through a few mechanisms. Many processes involved in oxidation can only be improved with volume and duration. This is neglected by short high intensity type training. I believe this is a major missing link. Our glycogen stores are relatively small and can be exhausted quite quickly. The greater our glycolytic capacity, the quicker we deplete glycogen. We cannot sustain activity of this type for long. We need an aerobic base to support our performance. Fat oxidization is a much more sustainable source of energy. The greater the oxidative capacity the higher the sustainable workload. One way to look at this is thinking of our aerobic base as our cruising speed. Our anaerobic and ATP-CP systems are our afterburner. The following graphic shows three athletes. Athlete A has a strong base (Oxidative system), an above average anaerobic capacity (Glycolytic system) and an above average ATP-CP capacity from his HIT training. Athlete B has an above average aerobic system but relies heavily on his anaerobic capacity. His ATP-CP stores are again average. Athlete C is our average weekend warrior for comparison. 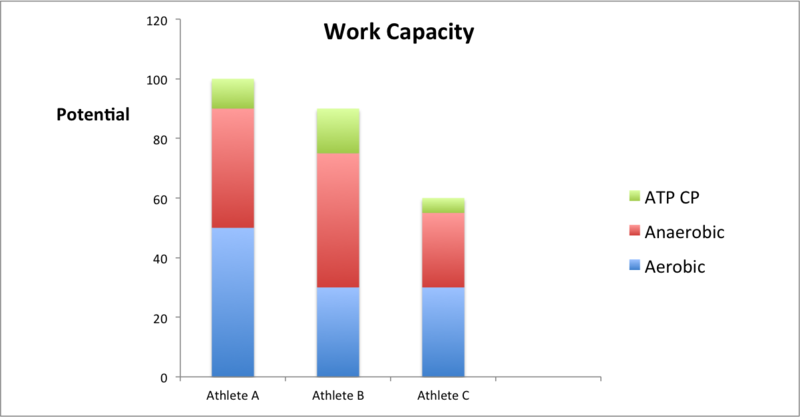 While athlete A and B are quite close in their overall work capacity, Athlete A has a better sustainable work capacity. His aerobic base allows him to maintain a high work rate. Athlete B almost matches Athlete A overall, but will never be as competitive when activity is of long duration. He may be able to complete short intense workouts with similar or better performances than Athlete A, but can only maintain high intensity for a short period. It is essential for an athlete’s conditioning that some period of his training regime include LSD style work. This ensures that he has a strong aerobic foundation to build upon. Longer duration, volume style training promotes structural changes which have great benefit to the cardiovascular system. Athletes of any sport should never neglect their aerobic work. It may seem boring and time consuming, but it is necessary. Recent media has given LSD style training a bad name, and cast a shadow over it. While HIT style work may be very effective overall it does not cover everything. Over utilizing it or neglecting other areas will undoubtedly create weaknesses in an athlete’s physiology. In a sport like Crossfit, these small holes in an athlete’s capabilities may cost them dearly in competition. Remember to subscribe to our email notifications for new posts each week! Previous Post Jetlag and the athlete! Next Post The critical factor to gaining muscle!